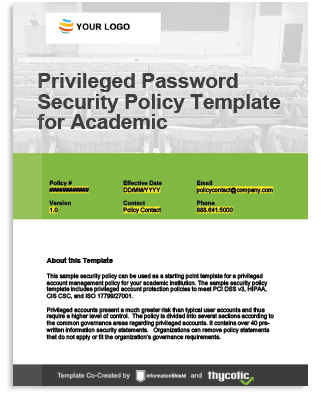 This free Privileged Password Security Policy Template gives you best-practice policies to help your organization improve IT security and demonstrate regulatory compliance. You’ll save hours of effort leveraging these policies that are easily customizable in a matter of minutes. Thycotic has also made it incredibly easy to publish your Privileged Password Security Policy with this free template and simultaneously enforce your password policies with Thycotic Secret Server. Your template is free forever; can be modified and distributed as needed; and is the most efficient tool for locking down your privileged account management policy. Thycotic Secret Server is available as a free edition or a free trial to get you started. Unlike any other security offering, Thycotic Secret Server assures the protection of privileged accounts while being the fastest to deploy, easiest to use, and highly scalable enterprise-class solution offered at a competitive price. Already securing privileged account access for more than 7,500 organizations worldwide, including Fortune 500 enterprises, Thycotic Secret Server is simply your best value for PAM (Privileged Account Management) protection. Security template co-created by Information Shield and Thycotic. Information Shield provides time-saving products and services to help build, update and maintain information security policies. Information Shield’s Common Policy Library (CPL) contains over 1600 pre-written information security policy templates covering all aspects of information security. Based in Houston, Texas, Information Shield has over 10,000 satisfied customers in 60 countries. For more policy templates, visit http://www.informationshield.com, email sales@informationshield.com or call 1.888.641.0500.